Make your party extra special with our beautiful gift hampers, packed with gorgeous gifts! 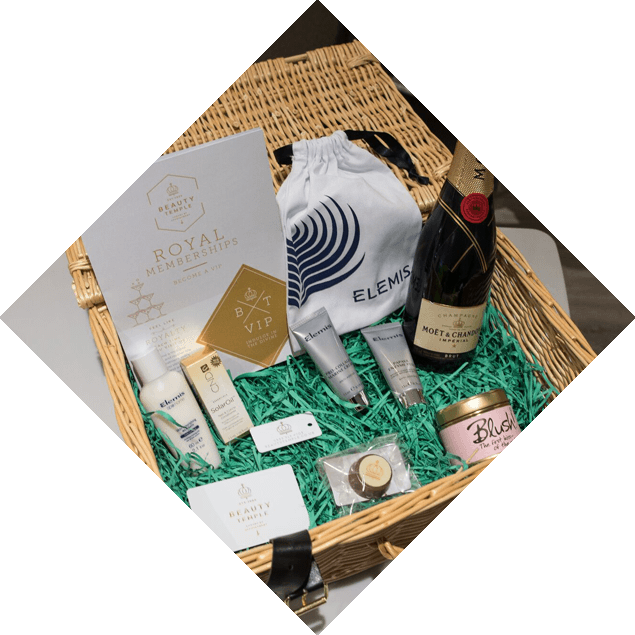 Whether its for a baby shower, hen party treats or a birthday present they won’t forget, each hamper is tailored to your party and individual to you. Hampers start at £25 and are available to order when you book your party. PACKAGE A: Nachos boxes served with salsa and cheese dips, salted caramel popcorn, all washed down with a glass of chilled Prosecco £7.50 per person. PACKAGE B: Selection of delicious cakes and sweet treats served on a vintage cupcake stand, served with a glass of chilled Prosecco £7.50 per person. If you’re in need of a treat why not combine both package A and B for only £10 per person, you know you deserve it! Take tea like the Royals and enjoy yummy cakes, the finest tea and of course, pampering! Choose either our Royal back massage or Pit Stop Facial then head over to our Champagne nail bar for a Paint Pot polish to fingers or toes (upgrade to gel for £5). Celebrate in style! Ideal for a pre-celebration treat, wedding preparation or special morning. Includes your choice of a Royal Manicure or Pedicure, your choice of a cheeky add on*, a light breakfast served in a picnic basket and a chilled glass of bubbly. Available between 8am - 11am. Total treatment time: 55 minutes. PARTIES FOR PRINCESSES & PRINCES TOO! Only Available at Mapperley and West Bridgford. A night of pampering for you and your friends, whether it’s for a birthday or just a girly get together! Includes: invitations, Bare Minerals makeup workshop – from smoky eyes to a fresh skin look, polish to fingers and toes, strawberry mini facial, Royal nibbles and mocktail, balloons and bunting to decorate the area.